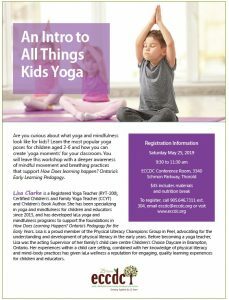 Are you curious about what yoga and mindfulness look like for kids? Learn the most popular yoga poses for children aged 2-6 and how you can create ‘yoga moments’ for your classroom. As a leader, one of your responsibilities is to shape the culture of your organization. 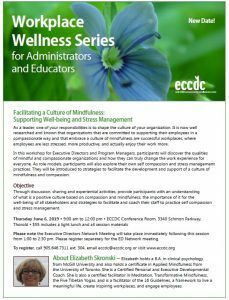 It is now well researched and known that organizations that are committed to supporting their employees in a compassionate way and that embrace a culture of mindfulness are successful workplaces, where employees are less stressed, more productive, and actually enjoy their work more. Reducing the Impact of Adverse Childhood Experiences and Children’s Toxic Stress through Developing Strong, Nurturing Relationships. 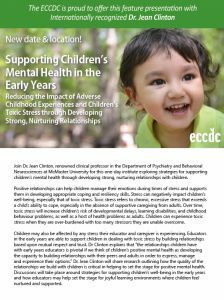 Join Dr. Jean Clinton, renowned clinical professor in the Department of Psychiatry and Behavioral Neurosciences at McMaster University for this one-day institute exploring strategies for supporting children’s mental health through developing strong, nurturing relationships with children. Have you ever wondered what do I say to a child who is grieving? How can I support them as they transition back to the classroom setting? Or what is typical behaviour to a death from a developmental stance? 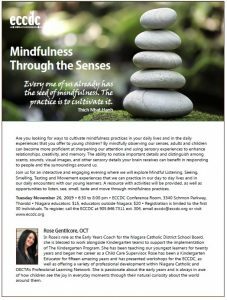 Are you looking for ways to cultivate mindfulness practices in your daily lives and in the daily experiences that you offer to young children? By mindfully observing our senses, adults and children can become more proficient at sharpening our attention and using sensory experiences to enhance relationships, creativity, and memory. The ability to notice important details and distinguish among scents, sounds, visual images, and other sensory details your brain receives can benefit in responding to people and the surroundings around us. Children express themselves, learn about their world, and feel most at ease when playing. 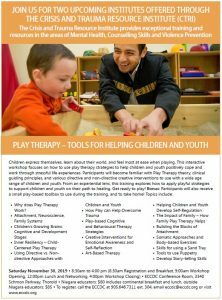 This interactive workshop focuses on how to use play therapy strategies to help children and youth positively cope and work through stressful life experiences.